Here's day 2 of a three day carp fishing quest on Rice Lake, Ontario. Woops! I meant to post this in the baits and tackle section...I don't know how to move it. Hey folks, here's a video I put together of my buddies and I fishing for carp on Rice Lake. This lake has an amazing carp fishery I wish I could get down there again. Hello, I am new to carp.com. 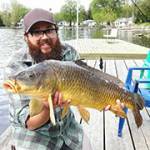 Although I live in Northern Ontario where there are very few carp opportunities I am formerly from Toronto where I developed a love of carp fishing. Now I get to sneak down to Southern Ontario for carping once or twice a year to catch these great fish. I also run a youtube fishing channel called Kokemachine, 4 Eel Fishing where I have recently made a few videos that care carp related. I look forward to reading up on other's love of carp fishing and sharing my experiences and videos.